Home Affairs minister, Peter Dutton, said that his department was considering fast-tracking visas on the humanitarian ground for white South African farmers looking to emigrate to Australia. The statement was made in response to the alleged persecution those farmers have been exposed to under the ongoing land reform in South Africa. In regards to white farmers in South Africa however, not all share the same opinion as Dutton. South Africa’s International Relations and Cooperation Minister, Lindiwe Sisulu, has slammed Peter Dutton’s comments, saying there is ‘no reason’ for South African white farmers to be offered a humanitarian settlement in Australia. Meanwhile, closer to home, Foreign Minister Julie Bishop voiced her objection to Dutton’s comment on Sunday. “Australia does monitor the rate of violent crime in South Africa, and there has been a dramatic increase in recent years. Last year there were about 19,000 murders in South Africa, and that’s a very high number for a country of that size. “We do have a humanitarian visa program if any person feels they are persecuted, then they can apply to Australia for a humanitarian visa, and that would be considered on its merits, and I believe that that’s what Peter Dutton is referring to. “I believe the humanitarian programmes’s credibility comes from the fact that it is nondiscriminatory and that each application is assessed on its merits. That’s been the case under the Turnbull government, and as far as I’m aware, there are no plans to change that visa program. Monday (19/3/18), Tony Abbott made a statement supporting Dutton’s comment on the white South African farmers. Let’s take a look at the persecution issue. As with everything else in life, there are always two sides of the story. South African officials, from Lindiwe Sisulu to the country’s new President, Cyril Ramaphosa, have denied its existence. Some prominent news outlets dismiss it (this and this), saying there are not enough official numbers that clearly shows that the killing is really taking place against the white farmers. That doesn’t mean the allegation is completely baseless, though. 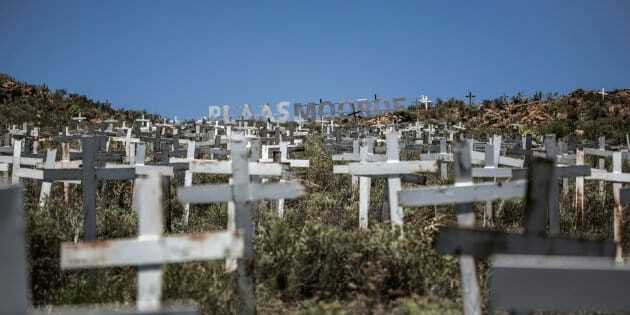 According to AfriForum, there were more than 400 attacks on white farmers last year alone. It’s safe to say that there are simply not enough data at their disposal to decide with a certain degree of certainty. 🇿🇦 While we found no evidence of a #WhiteGenocide in #SouthAfrica & the farm murder rate is in dispute, (white) farmers ARE being killed in horrific ways. What cannot be denied is that violence and killing are taking place at an alarming level in South Africa. As Julie Bishop pointed out, in 2016/17. there were 19,000 cases of murders in the country. According to Africa Check, 600s of them were farm murders. However, among these murders, not all the victims were white farmers. The Black First Land First sympathizers. 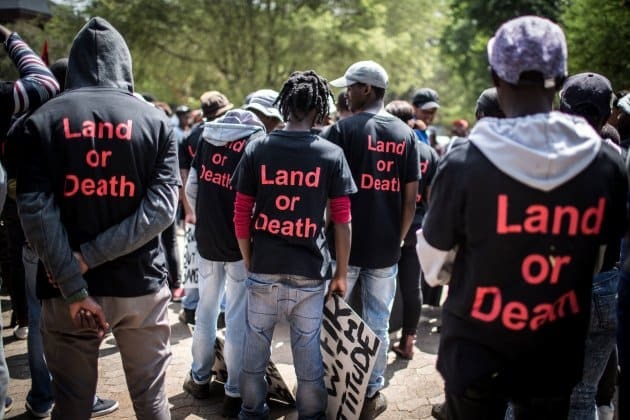 Tensions have been brewing over the former apartheid nation’s proposed land reform. South African President Cyril Ramaphosa, who came to power in February 2018, has vowed to “escalate the pace” of redistributing land from wealthy whites to poorer blacks. Up to 70% is thought to be owned by white Afrikaners and black South Africans hold the title deeds for less than 10% of the nation’s agricultural land. The country’s ruling ANC party has backed expropriation of land without compensation, motioned by the radical left Economic Freedom Fighters (EFF) party. Land ownership has been an important issue in South Africa since colonial time. Even more so in the post-apartheid era. Two decades after the apartheid crumbled, the nation once again found itself in a similar predicament. Not surprisingly, because in that time span only about 4 percent worth of land of the country’s total territory has been redistributed. Hence, Ramaphosa’s political rhetorics to speed things up. When people use political correctness (or lack thereof) to decide whether or not something is taking place; or when the existence of something can be confirmed or denied solely on political ground, we know that the society is in trouble. “It must serve as a warning that South Africa runs the risk to lose even more productive, loyal citizens should their concerns about issues such as property rights not be listened to in earnest and actions not be launched to address problems such as crime in the country.” Alana Bailey of AfriForum said. All South African farmers, white or black, should seriously consider migrating to Australia. Under humanitarian program or otherwise. For more info on Peter Dutton’s interview, check this page. Available occupations in farming and agriculture in Australia.